I wish I could take credit for this recipe. I love to create new dishes and experiment in the kitchen, but putting the ingredients from this recipe together in one dish is something I never would have thought of on my own. But even though I can't take credit for this recipe, I bumped it ahead of a few original recipes I have waiting to post because it is THAT good and needs to be shared. The other night I asked Jon to throw a bulb of garlic on the grill while he was making steaks. I didn't know what I was going to do with it, but knew I wanted to use it the next night. I also had half of a block of Gruyere cheese left over that I wanted to use - roasted garlic and Gruyere are so perfect together. So I googled "roasted garlic and Gruyere recipes." At first I was finding a lot of ads for roasted garlic Gruyere cheese. Um, yum! I think I need to find some!!! After looking for a bit I came across a recipe for Roasted Garlic and Lemon Rigatoni with Brown Butter and Gruyere on the Blog Baker by Nature. I read the recipe and knew it would be fabulous. I can't say enough good things about this pasta dish. Every bite gives you so many flavors that all work perfectly together - sweet roasted garlic, light and bright lemon, nutty brown butter and creamy and nutty Gruyere. Our sides really complemented the dish too - roasted Brussels sprouts and some roasted cherry tomatoes. I may have eaten 2 servings and then had the small amount of leftovers for lunch the next day and I already want to eat it again. Preheat oven to 375 degrees (F). Carefully slice the bottom off of head of garlic. Place in a small oven proof baking dish (or wrap in foil), drizzle with olive oil, and place in the oven to bake for 55 minutes. Remove garlic from baking dish to cool while you make your pasta. Or you can make this ahead of time. My husband roasted the garlic on the grill the night before I made this dish, and then I stored it in the fridge. Squeeze cooled garlic cloves out from the head and place them in a food processor or blender; set aside. In a small pan cook butter over medium heat, stirring frequently, until it’s just browned and smells slightly nutty (see this link if you have never made brown butter before). Pour butter into the food processor, then add the reserved pasta water, parsley, lemon zest, and juice of one lemon; pulse until smooth. Add mixture to pasta (as well as some red pepper flakes), stir, and heat on medium-low for 3-4 minutes, just until the pasta has warmed and is al dente. Remove from heat and stir in Gruyere. Taste, then add salt and pepper as needed. 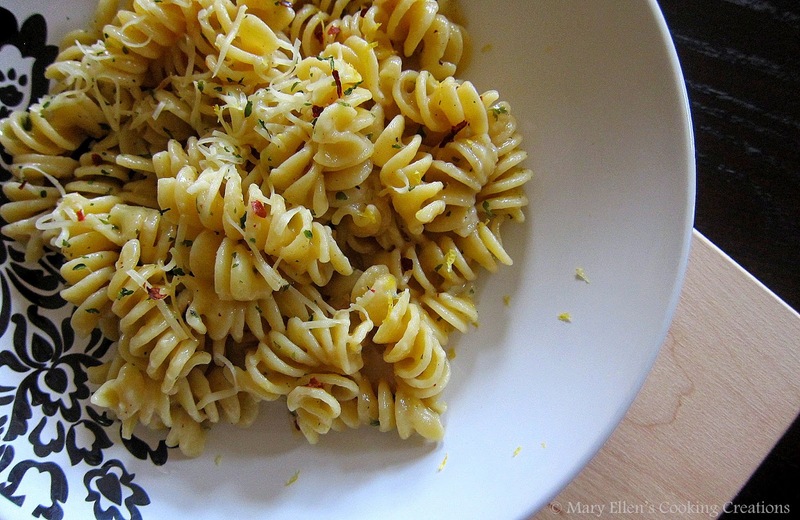 Right before serving drizzle olive oil over pasta and toss lightly. Serve warm with grated cheese.